Skylanders was one of the very last projects I worked on at Activision. In the shot, Spyro floated in as the toy and and then transformed into a living version of himself that you would then play in the game. The problem was that the toy version looked like less like the toy and more like Zoic's interpretation. I was asked to take the model from their cinematic (Below Left) and make it look more like the toy (Below right) at the beginning. Below is the image what I was able to get in a few days, using Zbrush, and some mental ray magic fun. They wound up not using the work I did because of the rendering overhead of IBL and Final Gather at the time was more than thy had time for, but whatever. This was still the sort of super fun challenge I don't usually get to do and I love me some Spyro. Feel free to message me if you like a breakdown of my workflow and/or you want to see a turn table of this little guy. OMG! 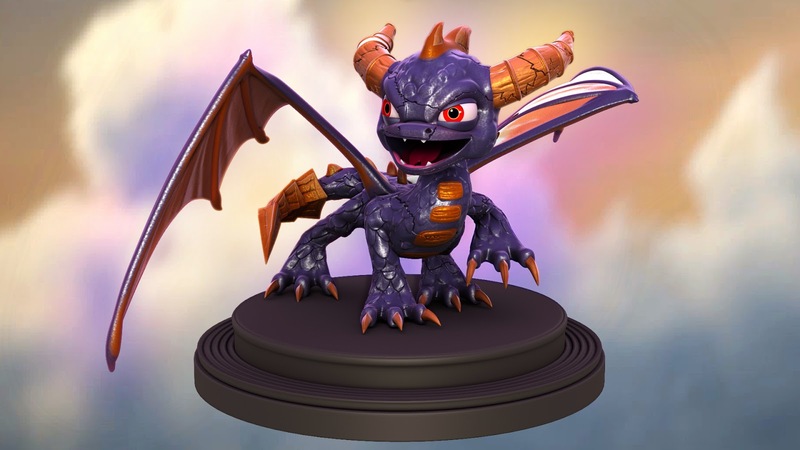 Spyro is my most favorite character in Skylanders! Do you think you can post more concept images you did for him, and perhaps the turntable bit you mentioned?